Mb, pî,Rd is the design plastic moment resistance of a beam; Mc,pt,m is the design plastic moment resistance of a column. (1) To model the deformational behaviour of a joint, account should be taken of the shear deformation of the web panel and the rotational deformation of the connections. 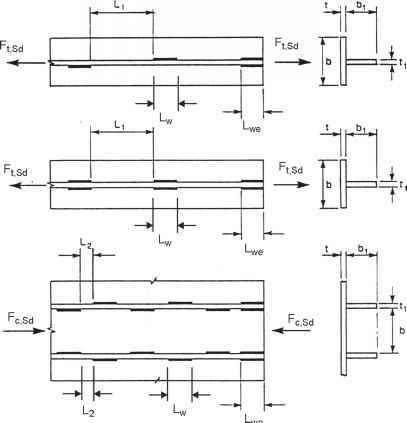 (2) Joint configurations should be designed to resist the internal bending moments Mb1Ed and Mb2,Ed , normal forces Nb1,Ed and Nb2,Ed and shear forces Wb1,Ed and Wb2,Ed applied to the connections by the connected members, see Figure 5.6. (4) To model a joint in a way that closely reproduces the expected behaviour, the web panel in shear and each of the connections should be modelled separately, taking account of the internal moments and forces in the members, acting at the periphery of the web panel, see Figure 5.6(a) and Figure 5.7. (5) As a simplified alternative to 5.3(4), a single-sided joint configuration may be modelled as a single joint, and a double-sided joint configuration may be modelled as two separate but inter-acting joints, one on each side. As a consequence a double-sided beam-to-column joint configuration has two moment-rotation characteristics, one for the right-hand joint and another for the left-hand joint. (6) In a double-sided, beam-to-column joint each joint should be modelled as a separate rotational spring, as shown in Figure 5.8, in which each spring has a moment-rotation characteristic that takes into account the behaviour of the web panel in shear as well as the influence of the relevant connection. fi\ is the value of the transformation parameter ft for the right-hand side joint; ¡32 is the value of the transformation parameter ft for the left-hand side joint. NOTE: The transformation parameters ft\ and ft-/ are used directly in 6.2.7.2(7) and 6.3.2(1). They are also used in 6.2.6.2(4) and 6.2.6.3(4) in connection with Table 6.3 to obtain the reduction factor co for shear. (8) Approximate values for f$x and ft2 based on the values of the beam moments Mbl Ed and MhZ,Ed at the periphery of the web panel, see Figure 5.6(a), may be obtained from Table 5.4.